The fun continued for the entire weekend as Golden Star Student Award winners from across the County came to the booth to collect prizes and take photos in the photo booth. At the end of every school year, EDCOE grants Golden Star Student Awards to those who have demonstrated their commitment to learning, becoming well-rounded, and giving back. 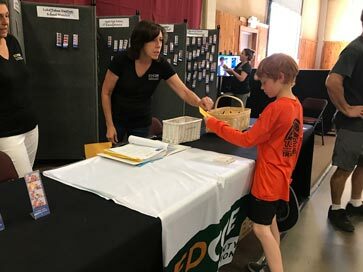 More than 5,000 students received an award certificate and a complimentary pass to the El Dorado County Fair. Individual schools determined criteria to recognize up to 20 percent of their student body. The criteria may have included scholastic achievement, outstanding citizenship, significant educational improvement, athletics, performing arts, community service, attendance, and more. This year, the Active 20-30 Hangtown #43 Club donated enough of their famous Fair tacos, so every single Golden Star Student who visited the booth could receive one. “We are all about the kids in our community service club and enjoy doing what we can to help out. Every year at this Fair, I am always impressed by the outpouring of community support and volunteers who make this booth possible. The money we raise goes to helping kids in other ways throughout the year,” said the Club’s Past-President Ryan West. For more information about the club and to connect, find their page on Facebook.